This one is particularly Amazeballs for me! Today I have a post that I have been waiting months to write! It's been quite the Countdown! I received a couple very exciting emails from a few of the Girl Fridays. They had each received publication acceptances. I was thrilled for them, however this was nothing out of the ordinary as the Girl Fridays are wicked talented, and get published all the time. 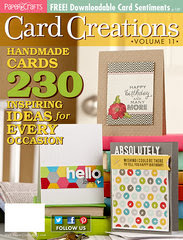 Paper Crafts Card Creations Volume 11!! but I had to remind myself over and over to Breathe while I waited for it appear at my local bookstore. I think they are the coolest projects EVER! but this is the one that started it all off, so I just had to celebrate. I think we should do a prize, don't you?? I'll choose 2 random winners to receive the CAS-ual Fridays Stamps set of their choice! the winners will be announced on Sunday!! The gals all did great, obviously! I am such a gem lover, I have to pick Lisa's card on pg 111 as my favorite. Clean & Simple & Beautiful! Thanks for a chance to start my CAS-ual Fridays stamp collection! All the cards are fabulous! Lisa's card on page 111 is my favorite though! Love the words from the Big Thanks set all lined up with the pretty gems in between! Very pretty card! I have to say it's a tie between Lisa's card on page 111 and Gayatri's card on page 40 for me. I love the gems and all of the white space on both of them. All are wonderful but I truly love Lisa's card ( pg. 111) best! She did a fantastic job using your new stamps! I love a perfect CAS, therefor I have to go with Lisa's card on page 111. Rainbow of Thanks on page 111 has my vote. CAS perfection! Congratulations, Michele and Lisa, Gayatri, & Karolyn! I have to agree with the ladies above that Rainbow of Thanks on page 11 by Lisa has my vote! I love CAS cards and all that white space. They are all equally fantastic though. Way to go gals!!! I haven't gotten this new issue yet, but adore the Exclamations set! You had me at BOO-YAH! yay congratulations!!! I love the Exclamations set because of the fun sayings on it... totally right up my ally!!! That's awesome!!!! My very favorite set of yours is WTF--so stinkin' clever! I use it a lot right now because all my friends are turning 40 (I'm forever 29....). Congrats to you and your company! So many exciting things are happening for your sweet stamps and company. Congrats!!! Breathe, Truth is, and Big Thanks are on my wishlist! How totally exciting! I think that Truth Is is my favorite! OMG!!! This is so cool! Paper Crafts is my favorite magazine but I haven't gotten this issue "yet". Now I really can't wait to get it! Truth is, Beanstalks and Amazing Balls are my faves at the moment! Winning would make my day!!!! I haven't gotten this edition yet, but plan to pick it up as I love Papercrafts magazine (such great inspiration!). My favorite is 'Exclamations' as I say most of the phrases and I love the fonts you used. They are so graphic and easy to build cards around! Congratulations! So exciting! Breathe and WTF are my favorites. WTF is so clever and Breath has such great sentiments! How exciting to see your designs in print! That has to be such a surreal feeling. I don't need a copy of the issue, but I wanted to say congrats to you and the designs! Such exciting news! I don't have the issue yet but I'm partial to the Countdown because of the border images and the Big Thanks because I love circles and dots! Congratulations to you!! What a great recognition! I don't have the magazine but can't wait to get it. So on my wishlist is the set Breathe. I've been eyeing it up for some time now. congrats! All the cards are great. Lisa's CAS card is my fav. I'm afraid my budget prevented me from getting a copy of this magazine (yet), so I'm off to the Girl Fridays blogs to check them out...thanks so much for a chance to win a copy! I apologize...I think I misunderstood. My fave is "Big Thanks"...it's so versatile and FUN! And, congrats on all the upcoming pubs...you are so deserving of all the success your company has brought your way! I don't have the magazine but I like Loving Thoughts. Congratulations ! I love all your stamps because they are so unique and have great sayings! My favorite is Amazeballs, WTF,Exclamations...oh I just love them all!! That mag is in my April budget. I so love "only you". All of your designs are delightful. Congratulations on the publication of your stamps in use on fantastic cards. Published before you were even officially launched?! Woot woot! That's amazing. Congratulations. I don't have the magazine, but I adore your stamp sets. Amazeballs is my fave to date. Michele, you've got me crackin' up over here. I was so happy to that my first publication was right alongside the fabulous creations of my teammies! I made sure to show my hubs all of them. "See this? It's CAS-ual Fridays. And this, CAS-ual Fridays..." So, so very happy to see your awesome stamps in print!!!!!!! You deserve it!! I don't have the magaine (yet) but my favorites are WTF and Loving Thoughts. Congratulations on your stamps being published. My favorite is Karolyn's happy card on pg 43! I'm just popping on to say CONGRATULATIONS THIS IS AWESOME SAUCE!!!!! Seriously!!!! I saw your first sets and was INSTA IN LOVE!!!!! Yes your GF's are WICKED TALENTED FOR SURE!!!! I don't have this issue yet but look forward to seeing these cards. My favorite set is all of them :) but I really like the swoosh & sentiments on Breathe & the beautiful flowers on Loving Thoughts.